That's quite a weak song for a single, isn't it? Khashoggi wrote: That's quite a weak song for a single, isn't it? I knew the recorded version before, and still think it's a weak song. Good tune IMO . I hope it does well for him. I was dubious when I first heard it but the words are meaningful which is something, and as usual it's a whole lot better when he sings it live and without that weird wobble that seems to be so fashionable for singers to do at the moment, although he can do it without the auto tune which most can't. I really do like the video though with the whole light and dark theme, I know it's been done before but it's worth repeating. My main complaint is that it's one of the few songs on the album which he didn't write himself, which means that we still get haters claiming that he can't write. That is such a shame as he is a far better songwriter than people give him credit for, maybe than he gives himself credit for, and my favourites on FYE were songs which he had had a hand in writing himself like Broken Open or Down The Rabbit hole. I'm hoping that the next single is an upbeat one like Cuckoo or Trespassing which he wrote himself. Shady would also be good although we haven't heard it yet it sounds very interesting and Nile Rogers guests on it. I have a suspicion that it may be the Bruno Mars one though which we haven't heard yet, because Bruno is the industry darling at the moment and it will get more radio play. I agree with soxtalon, I think it's great to see Brian and Roger perform instead of just doing nothing. Earlier in the thread it was mentioned that one of Adam's new songs 'Trespassing' had a similar funky vibe to AOBTD. In fact, let me go one further.... It is a travesty. Brian and Roger could literally do anything... And they choose this. 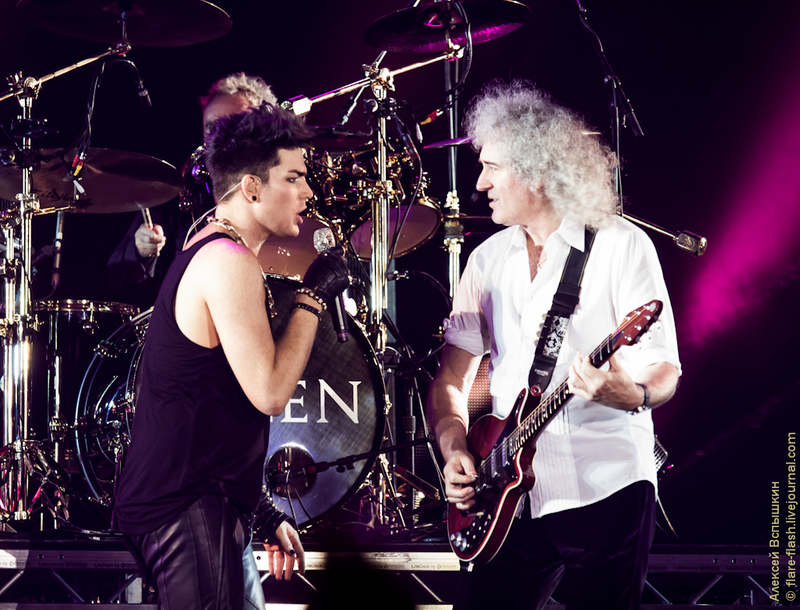 Why is it a travesty for Queen and Adam Lambert to perform together? What credentials do you need to sing with Queen? You may not like the music Adam sings or write, but he is still a great singer as many in the music industry have stated. People do covers of Elvis, Beatles, Joplin, Stones, Michael Jackson, Otis Redding, Roy Orbison etc., but no ones says thats a travesty or how its ruining their legacy. Freddie Mercury is a rock icon, just as the others I mentioned are rock/pop icons. The only ones that can ruin Queen and Freddie's legacy are his fans. All their history still exists no matter who sings with Queen. Are the fans afraid someone might do it better? If not, their shouldn't be a problem. This concert will help to keep Queen's music and legacy in the forefront. Promite wrote: Earlier in the thread it was mentioned that one of Adam's new songs 'Trespassing' had a similar funky vibe to AOBTD. Pay no attention to this Adam hater from the U.S. I'm pretty sure he has been stalking me because he posts what I post here on another website where he is the mocker-in-chief of everything connected with Adam Lambert. Hi, Macho! How are ya? Wow CNB! Your paranoia is alarming! It's time to step back from that computer and take a chill pill. You are so off the mark that it's actually funny. I don't know how you could jump to the conclusion that I must be a hater from another board who is stalking you just because I posted a video. Let me explain that I posted the video because I like the song and the beat reminded me of AOBTD. I thought that some Queen fans might be interested enough to listen to it. Adam wrote the song as a statement to the music industry/radio Program Directors who want to shut him out because he is too Gay/OTT/comes from Reality TV/doesn't fit any Genre/has too many female fans. It also could be taken as a message to Queen fans who don't want him singing with Queen. I'm not trying to start any fan wars. FYI CNB I'm a Queen and Adam Lambert fan. I actually like most of your posts except I think sometimes you try to push Adam too much on this Queen website and it gets embarrassing. Here is a snippet of the song 'Trespassing' studio version. I think it's AOBTD meets WWRY and would be great in a stadium. Promite wrote: Here is a snippet of the song 'Trespassing' studio version.